Blessing over the wine for the festival of Passover, Sunday through Thursday. Download a printable version of all of the Passover Kiddush blessings. Baruch atah, Adonai Eloheinu, Melech haolam, borei p'ri hagafen. 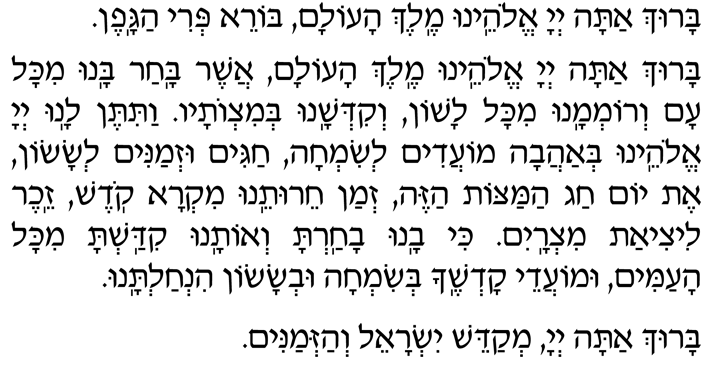 Baruch atah, Adonai Eloheinu, Melech haolam, asher bachar banu mikol am, v'rom'manu mikol lashon, v'kid'shanu b'mitzvotav. Vatiten lanu, Adonai Eloheinu, b'ahavah mo-adim l'simchah, chagim uz'manim l'sason, et yom Chag HaMatzot hazeh, z'man cheiruteinu, mikra kodesh, zeicher litziat Mitzrayim. Ki vanu vacharta v'otanu kidashta mikol haamim umo-adei kodsh'cha b'simchah uv'sason hinchaltanu. Baruch atah, Adonai m'kadeish Yisrael v'hazmanim. Blessed are You, Adonai our God, Ruler of the world, Creator of the fruit of the vine. Blessed are You, Our God, Sovereign of the universe, who has chosen us from among the peoples, exalting us by hallowing us with mitzvot. In Your love, Adonai our God, You have given us feasts of gladness, and seasons of joy; this Festival of Pesach, season of our freedom, a sacred occasion, a remembrance of the Exodus from Egypt. For You have chosen us from all peoples and consecrated us to Your service, and given us the Festivals, a time of gladness and joy. Blessed are You, Adonai, who sanctifies Israel and the Festivals. We recite the Shehecheyanu, thanking God for allowing us to reach this day. Praise to You, Adonai our God, Sovereign of the universe, for giving us life, for sustaining us, and for enabling us to reach this season.